It is with great sadness that we announce the passing of Gerald Clifford Nurse. He passed away peacefully on Monday, February 18th, 2019 surrounded by family. 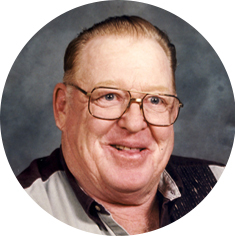 Gerald was born May 21st, 1935 to Lloyd and Mae Nurse on the family farm at Tyvan, SK. He moved to a farm south of Fillmore, SK when he was two years old. Gerald attended school at Fillmore and during this time he developed his strong love of sports and animals. After leaving school, Gerald worked various jobs including trucking and at the Ast’s Department store before his love of animals took him back to farming. In 1958, Gerald married the love of his life and best friend Shirley. Together they were blessed with three daughters and one son. They spent 50 years on a mixed farm outside Fillmore and moved to Moose Jaw in 2015 to be closer to family. Gerald’s sporting career spanned over 50 years including hockey and baseball. The last 29 years were spent with the Fillmore Old Timers Baseball. He was active in the community serving on many boards and spent 33 years on the RM of Fillmore Council as both Councillor and Reeve. Throughout his life, Gerald enjoyed the many visits from his family to the farm. The grandkids spent numerous hours breaking and fixing things, learning to drive, having bonfires, building forts, feeding cattle, and helping Grandpa with whatever projects he had going on. He enjoyed his daily visits to the Post Office and then to Osage for coffee and the latest news. His favourite family moments were sharing meals in the field during harvest and the family get togethers during holidays throughout the year. Gerald travelled the province for the Twiliter’s Baseball tournaments for many years, which later turned into trips to the Casino. He was predeceased by his daughter, Cleone; parents, Lloyd and Mae Nurse; brother, Ken Nurse; nephew, Wes Foss; his recently deceased niece, Bev Ogden; special friend and cousin, George Gillies; as well as many special four-legged friends including his last travelling companion, Freddie. Gerald is survived by his wife of 60 years, Shirley; daughter, Penny (Darwin); son, Perry; daughter, Donna; and son-in-law, Brian Phillips (Janet); grandchildren: Bart (Lisa), Justin (Renita), Nathan (Natalie), Therin (Kimberley), Cole, and Maddison; great-grandchildren: Carter, Kailynn, Kenzie, Isabelle, Rhett, Hunter, Abigail, Keslar, and Tate; special 4-legged companion, Punk; sisters-in-law, Mary Nurse and Maxine Foss; as well numerous nieces and nephews. The family would like to thank the staff of Extendicare in Moose Jaw for the wonderful care he was provided during his stay for the past three years. They became part of our family. A Graveside Service and a gathering will be held at a later date. Flowers are gratefully declined. As an expression of sympathy, donations in Gerald’s name may be made to the Allan Blair Cancer Centre c/o Pasqua Hospital, 4101 Dewdney Ave, Regina, SK S4T 7T1, The Moose Jaw Humane Society, Box 1658 Station Main, Moose Jaw, SK S6H 7K7, or to a charity of one’s choice. Arrangements are entrusted to Moose Jaw Funeral Home, 268 Mulberry Lane. Todd Sjoberg, Funeral Director 306-693-4550. Our hearts go out to you during this difficult time. May memories of happier times help you thru the coming days. We will miss visiting with you and Gerald when we go to see Ed at Extendicare. Having Gerald as a roommate was great and we’re happy we had the chance to get to know both of you. Please accept our sincere condolences on your loss. My family and I are saddened to hear of your dad’s passing. Please accept our most sincere condolences. Thinking of you and your family at this time. I am sad to hear that Mr. Nurse had dead, and I wish to share my sympathy with all of you in the family. I would also like to share two beautiful Bible scriptures with you that you could see Mr. Nurse alive again as mentioned in 1Corinthians 15: 22-26. & John 5: 28,29. James as one of JW. I am so sorry to hear of Geralds passing I always loved seeing you both when I cam to extendicare. May your memories help you in this time of grief. We are very sorry to hear of your loss Shirley. Our thoughts are with you and your family. Dear Shirley and family. So many great memories of Gerald. One is of the great hugs he would give…so sending back the biggest hug to you. You will be in our thoughts as you find your way through this difficult days. Our sincere condolences in the passing of Gerry. May the many good memories of him remain with you as we all move forward without his guiding presence.